The castle is open every day of the year, except the 1st of January and the 25th of December. The castle closes its doors at the latest 1 hour after the ticket office closes. While this is sufficient time for visitors to tour the castle in good conditions, we nonetheless recommend coming early enough to ensure an optimal visit to our monument. The following prices are subject to change during special events or themed days at Chillon Castle. Have a look at all the partners offers to benefit from preferential rates! 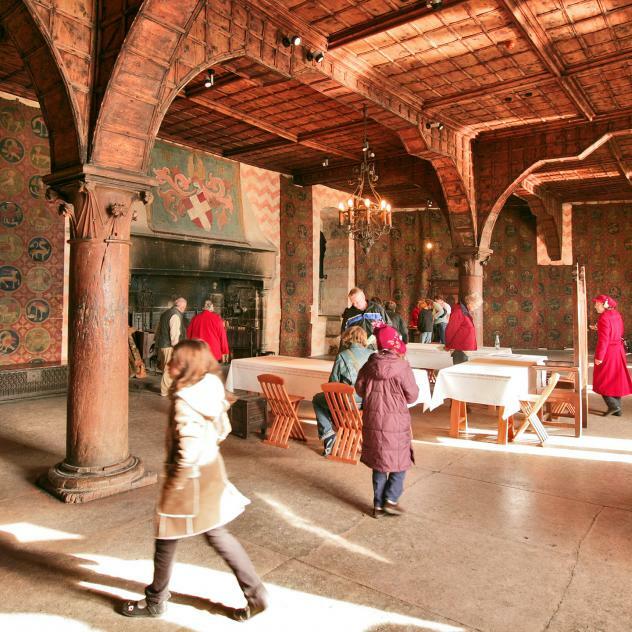 Chillon offers different guided tours for groups of up to 40 people from CHF 90.00/guide, available in 10 languages. We highly recommend a guided tour for groups. Guided tours are only available by reservation, made at least 2 working days before the date required, and using the attached form. For visits without a guide there is an explanatory brochure available for individual visitors in the following languages: Czech, Dutch, English, French, German, Hebrew, Hungarian, Italian, Japanese, Korean, Mandarin, Polish, Portuguese, Russian, Spanish,Thai and Arabic. Tickets may be paid in cash: CHF, EUR* or USD* (*bills only, change in CHF) or by credit cards (Maestro and Postcard, American Express, Eurocard, JCB and Visa) or with REKA travel cheques (no bank or travellers cheques). Billing is only possible via agencies who work with the castle on a regular basis and who have a representative in Switzerland. or 140.00 (TVA 7,7% incl) with guide in medieval costume CHF 5.00 "Everyday life in the Middle Ages"
"Building and defending a fortress"
The Castle must be visited during opening times. Benefit from the RailAway combined offer: 20% reduction on the journey by train or boat and reduced entry fee to Chillon. Line N° 201 from Vevey, Montreux or Villeneuve. Close to the castle, there is a pretty beach just right for a dip in the lake. From June to October the charming, discreetly hidden little beach of Chillon Castle is available exclusively for your private use to celebrate a special event in a truly original location. The areas open to the public include the rooms, halls and courtyards beyond the ticket office subject to payment of an entrance fee and to fixed opening and closing times. 2) any person not employed at the castle on the premises, even for professional reasons. It is strictly forbidden to bring into the areas open to the public any objects which, due to their character or end-use might be a risk for the security and safety of persons or property, works of art and/or buildings, such as any type whatsoever of arms or weapons, munitions, tools (cutters, screwdrivers, wrenches, hammers, pliers, clippers, etc. ), knives, razors, baseball bats, excessively heavy, cumbersome or smelly objects, or any type of explosive, flammable or volatile substance. Certain rooms or halls being temporarily closed shall not entitle visitors to any reimbursement of the entrance ticket. Prams, pushchairs and/or strollers are forbidden on the tour of the castle visit. Any infraction of these provisions observed during inspection or monitoring of the areas open to the public entitles the Management to alert the police or security forces. Visitors are required to comply with the warnings and/or orders of Chillon Castle administration and security staff at all times. Chillon Castle is an historical monument and it is under video surveillance. Respecting some basic rules will enable all visitors to enjoy it in optimal conditions whilst preserving the heritage site for future generations. 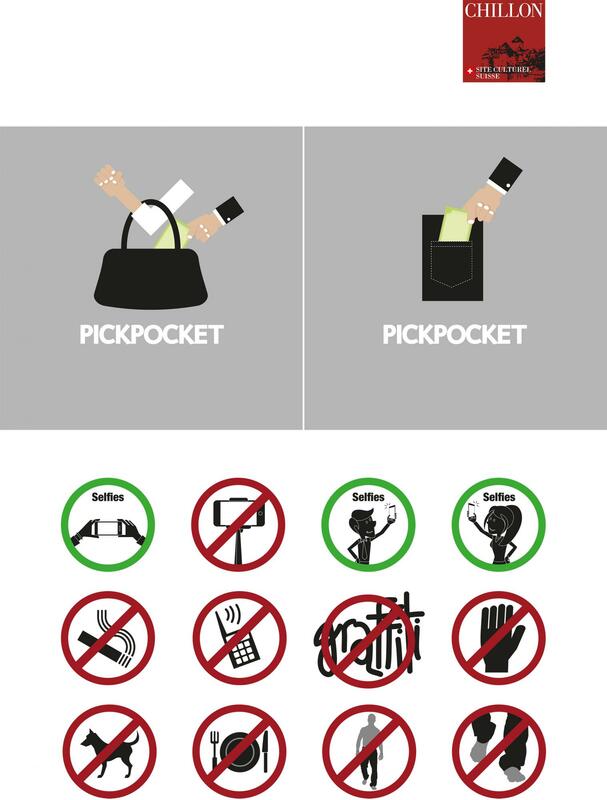 Visitors are required to behave in a correct manner towards the staff as well as towards other visitors. Smoking (electronic cigarettess too) is forbidden in the castle, both inside the buildings and in the courtyards. It is a museum and therefore a public area. It is forbidden to enter the castle in bathing suits, without a shirt or t-shirt, or dressed in any manner that might be disruptive to the public. It is forbidden to walk barefoot within the castle premises. Running in the rooms, halls or courtyards is not permitted. No eating and/or drinking is allowed other than in the areas specified. Animals are not accepted except guide-dogs for the blind. Writing on or “tagging” walls and/or objects is strictly forbidden. Touching the wall-paintings, tapestries, furniture and weapons is not allowed. They can be damaged by the slightest touch. No seats or other furnishings may be moved without the permission of the administration and/or security staff. Crossing barriers or other provisions for limiting access of the public is forbidden. Children and under-age youngsters must not be left unsupervised. It is forbidden to litter by throwing paper or any other object on the ground or elsewhere, including sticking chewing gum on any surface whatsoever. In addition, we ask visitors to speak softly and to refrain from using mobile phones within the castle, so that other visitors can experience the monument in the calm best suited to the visit. We hope we need not point out that this is a medieval building and, as such, customary contemporary safety norms cannot always be applied. We therefore recommend that visitors pay particular attention to any obstacles, such as low door frames, steep and/or winding staircases, etc., that could be dangerous. Visitors are responsible for their own safety and for the safety of anyone in their care. The works in the halls with permanent collections may be photographed or filmed for the visitor’s private use. However, the use of a flash or any other kind of lighting is not allowed. Professional photography, shooting films (UAV included), recording radio or television programmes are subject to special regulations and must be authorised in writing by the management of Chillon Castle beforehand. Authorisation for the above is accompanied by a list of specifications stipulating the conditions for the use of the site. Any and all recording, filming or photography of the castle staff or of visitors to the castle also requires their agreement. Permission for all and any professional photography shooting, film shooting (including drones), radio and television programme filming is subject to special regulations and requires written authorisation in advance from Chillon Castle management. 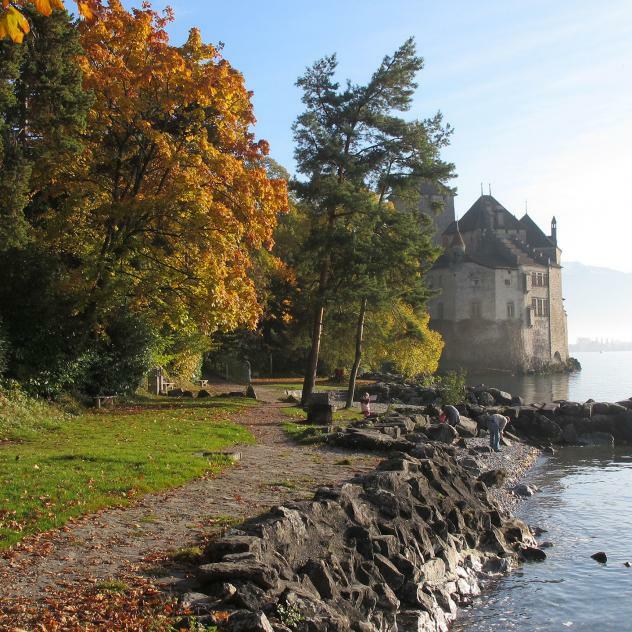 Requests must be received in writing at least two months prior to the filming or shooting.Chillon Castle declines any liability towards third-parties in the event of an infraction of this provision. All and any kind of business, advertising, propaganda or soliciting activities are forbidden, as well as public gatherings or demonstrations.